The Dish: Food Trucks Go Uncurbed Traveling restaurant fills vacant spaces with breakthrough mix of trucks, art, and entertainment. Traveling restaurant fills vacant spaces with breakthrough mix of trucks, art, and entertainment. Vacant spaces have long been the locale-du-jour for city artists who buck the trends, a blank slate for graffiti and public artists to temporarily leave their marks. 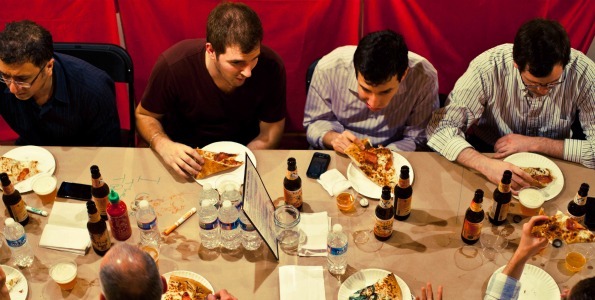 Now, the District’s empty pockets are home to yet another venture on the cutting edge: Uncurbed, the traveling restaurant that’s so much more than your average food truck. Recently, Uncurbed (which is actually a collection of different food trucks) reemerged in Dupont Circle at the vacant property at 1134 19th St., NW. 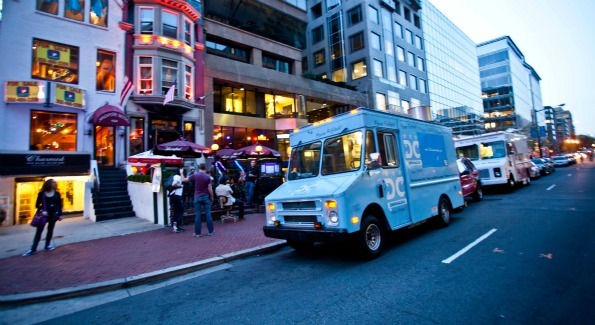 This foodie-on-foot experience offered a five-course menu featuring five of The District’s top trucks: DC Empanadas, DC Slices, Takorean, The Rolling Ficelle, and Curbside Cupcakes, along with beer from Flying Dog Brewery. And there was a burning after-party – Uncurbed partnered with Mischief to host the first Uncurbed After Dark event. Local DJs, artwork, and a light show were all part of the festive atmosphere – which also included no sidewalk lines, and no awkward perching on curbs while enjoying a piece of DC Slice. Jeff Kelley of Wonky Promotions, which partners with verdeHOUSE to produce Uncurbed, said the venture was “born out of a desire to bring vibrancy to vacant spaces through a combination of great food, local art, and lively entertainment.” By taking the food-truck phenomenon from the streets and giving it a shared home, it seems Uncurbed has succeeded in making a “vibrant” breakthrough in community chowing. For more information on Uncurbed, please click here.